Bolo Ganpati Bappa Ki Jai ! of Lord Ganesha, the son of Shiva and Goddess Parvati. in the Maratha reign, with Chatrapati Shivaji starting the festival. the son of Lord Shiva and Goddess Parvati. Although there are many stories attached to his birth. Goddess Parvati was the creator of Ganpati. due to his mother`s orders. Enraged, Lord Shiva cut off Ganesha`s head. towards her child in negligence and bring his head. and brought to Lord Shiva. on Ganesha`s body and brought it to life again. (from Bhadrapad Shudh Chaturthi to Ananta Chaturdashi). Homes are decorated with flowers. Temples witness the visit of large number of devotees. Poojas are performed and bhajans are chanted. Often, families gather together to celebrate the festival. celebrate the festival with friends and family. the idol of Lord Ganesha is taken on the streets. on the streets along with the idol. The idol is finally immersed in the river or sea. expressing their happiness and offering their prayers. clay idol of Lord Ganesha in your home. Various dishes are cooked for offering (bhog). water and then decorated with flowers. Jyoti is lit and then the aarti begins. Various bhajans, and mantras are chanted at this time. complete devotion brings life to the idol. and brings prosperity and good fortune with him. For the same reason the day is observed as a very auspicious day. is therefore one of the main dishes made on this day. Other dishes include Karanji, ladu, barfi and pede. on earth for all his devotees during this festival. It is the day when Ganesha was born. at the beginning of any new venture or at the start of travel. starting on the shukla chaturthi (fourth day of the waxing moon period). ending on Anant Chaturdashi (fourteenth day of the waxing moon period). 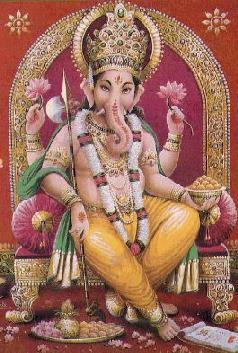 Anant Chaturthi (or Anant Chaturdashi) is the last day of the “Ganesh festival”. on the 14th day of the bright Bhadrapada (the sixth month of Hindu calendar). but to be welcomed the next year with equal fervor. which if kept for 14 years is supposed to bring wealth. ("father Ganpati, come again next year").
. The 10 day long festival comes to an end after the immersion ceremony is over.